Welcome to the Segwii project! 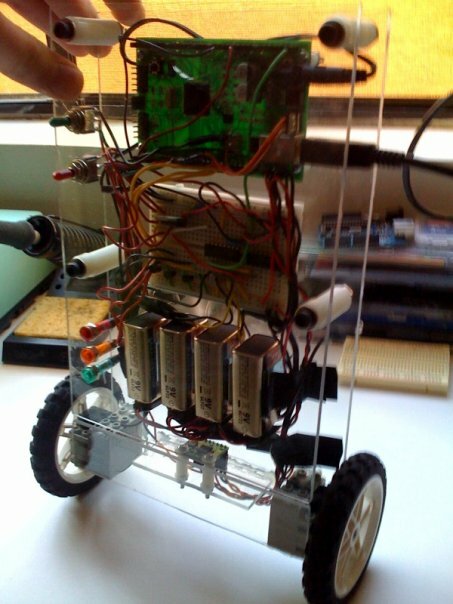 The Segwii is a self balancing robot that is remotely controlled by a wiimote. The goal of this project is to educate robot enthusiasts, share ideas, and to improve on designs. There are many things to learn and help out in, including open source software and hardware, complementary filtering, PID (Proportional Integral Derivatives), and embedded systems programming. As a contributor to the site, you will be able to replicate this project, expand upon our existing design, and network with others about this and future projects. Please do note that the code for the wiimote control isn't very well developed at this time, however I plan to upgrade the hardware and refine the code in late June. Copyright (c) 2009 segwii.com. All rights reserved.